Artist's rendering of how the first stars in the universe may have looked. Scientists have probed a period of the universe's ea rly history that no one has been able to explore before â" and they got a surprise: It was far colder in the young universe, before the first stars blinked on, than astronomers previously thought. What's more, that cosmic chill may have come from previously unknown interactions between normal matter and mysterious, so-called dark matter, according to two new reports in the journal Nature. If so, it's the first time scientists have observed any effect of dark matter other than its gravitational pull. All of this comes from an experiment that detected a faint radio signal from primordial hydrogen gas in the young universe, just 180 million years after the Big Bang. "What we've seen is the evidence of the first hydrogen at a point where the stars are just beginning, the very early stars," says Alan Rogers, a researcher at MIT's Haystack Observatory. 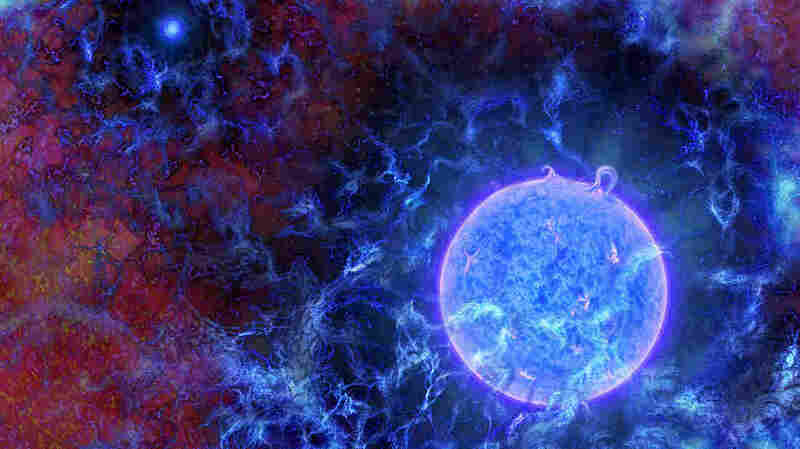 In its first days, the universe was dark and filled with hydrogen. Some of that gas then coalesced into stars that began to turn on and light up, affecting the surrounding hydrogen gas and producing a telltale signature. 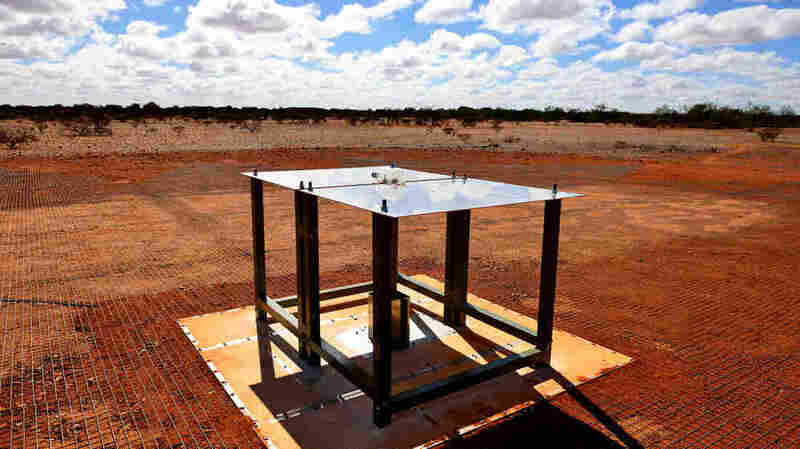 The EDGES ground-based radio spectrometer, CSIRO's Murchison Radio-astronomy Observatory in Western Australia. A couple of years ago they started to see a signal, but it wasn't what they expected. "We work with theorists, and we know what theorists expect for this signal produced by the first stars. And what we were seeing was different," says Raul Monsalve of the University of Colorado, Boulder. "Specifically, it was a larger signal." The most probable explanation was that the hydrogen gas back then was twice as cold as the theorists had predicted, at a temperature of about minus 454 degrees Fahrenheit. "It did get me excited, but nonetheless a t that point I knew â" we all knew â" we had to do multiple verification tests," says Nivedita Mahesh, a graduate student on the team. As months passed and the result kept checking out, the scientists began to wonder what could have been cooling down the gas back then. Judd Bowman of Arizona State University shared the odd findings with Rennan Barkana, of Tel Aviv University in Israel. "I was a little bit skeptical â" it was a big surprise," says Barkana. "I mean, the strength of the signal was outside the large range of possibilities that people were thinking about before." About 24 hours later he was in the car with his wife, going to her parents' house on a Friday afternoon, telling her about this puzzle. "Then it hit me that there's only one candidate for some component of the universe that can actually be even colder, and that's dark matter," he says. "Dark matter is a very big mystery," Barkana says. "We know it's most of the matter in the universe, but we have no idea about its properties." Scientists only know about dark matter because they have observed the effect of its gravity. "Other than gravity, we haven't had any clues," he says. He began to think about dark matter in the context of the first stars, and did some calculations. His work suggests the hydrogen gas could be cooled by interactions with dark matter particles that are relatively light, as opposed to the heavier mass people have been theorizing. "The idea that a detectable radio signal from the cosmic dawn can be connected to the particle properties of dark matter suggests a potentially revolutionary angle for exploring fundamental physics," Lincoln Greenhill of Harvard University wrote in an opinion article for Nature about the new work. Everyone agrees that another group working independently needs to confirm the existence of this radio signal from the early universe. "It's very important that this whole result we've got definitely needs to be confirmed, absolutely," says Rogers. But if the temperature discrepancy holds up, then the argument over what explains it can really begin in earnest. "It's a really, really interesting result, and a very exciting one as well," says Katie Mack, an astrophysicist at North Carolina State University. "This was not something that was predicted by any of the usual astrophysical models." With th e exception of the afterglow of the Big Bang itself â" the cosmic microwave background â" this observation marks the farthest back in time that scientists ever have been able to investigate, says Mack. "It's the earliest detection of any kind of astrophysics, ever," she says. "This is a signature of the very first stars in the universe, and the very first black holes in the universe. This is way earlier than anything else." The idea that dark matter might play a role makes this even more intriguing. "If that's the case, then we've detected the first non-gravitational interaction between dark matter and anything," says Mack, who says this may turn out to be the first evidence that "dark matter does anything at all other than sit there and gravitate."